Whoever said there is no real/good Mexican food in NYC, I am proving them wrong right now! 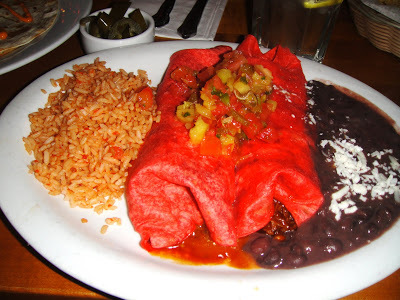 Baby Bo’s Cantina in Murray Hill, NYC, was one of the best Mexican meals I’ve had in a long time. It was so good! I went with my sister and a friend, and it is the cutest little Mexican spot- total hole in the wall, but charming and cozy. It was packed when we got there, and when we sat at the bar, a couple minutes later we turned around to look at the door and there was a line of people waiting to be seated. ~Quesadilla Enorme with shredded beef- this was one of the best quesadillas I ever had! Inside was shredded beef, gooey cheese (the cheese was so creamy and amazing), beans, and topped with gaucamole, jalapenos, and chipotle sauce. I love my chipotle sauce, or any sauce for that matter! It was perfection. A quesadilla done right! ~*BBQ DUCK BURRITO- 3 words for this. I COULD DIE. It was so good! This was one of my top favorite things I’ve had in New York. It was bursting with flavors. So unique. It’s roasted duck in their tequila-habanero BBQ sauce (which isn’t too spicy for all you people who can’t handle the spicy lol), and inside was melted monterey jack cheese, black beans wrapped in two tomato tortillas with a side of black beans, red rice & grilled pinapple pico de gallo. I of course had to have a side of guacamole with this. Everything tastes better with avocado or gauc! 🙂 This BBQ duck burrito is *HIGHLY RECOMMENDED*.